Making a house a home is extremely important for both you and your family. It is the place where the most memories will be made and therefore has to be as perfect as possible. Those who are proud of their home want to ensure their house is also the best that it can be, with the correct decorations and the theme that most suits the family. When guests arrive at their home, first impressions are the lasting ones and therefore it is important to impress. There are many ways of creating the perfect home that will leave your neighbours and guests speechless and in admiration of the home you have spent a long time creating. Having a feature in your home is one of the easiest ways to draw attention in the room and creating a sense of awe. This feature is possible in a number of ways, with one of the most popular being the addition of a feature wall. Having your wall as a feature is inexpensive and one of the easiest ways of creating a talking point in the room. By simply adding wallpaper to one wall can create a whole new image and creates a sophisticated and elegant addition to any space. An alternative way to create a feature in your home is by having an object of interest to people and this can be either in the home or the garden. For a garden feature, the most popular item is probably a water feature or small fountain placed in the centre of the lawn, or an eye catching pond, filled with fish. There are different options for inside the home, with a staircase being just one idea. Having a bespoke staircase will create a unique talking point in your home and as you are able to choose every element, from the design to the colour scheme, it is personal to you and therefore perfect for your home. 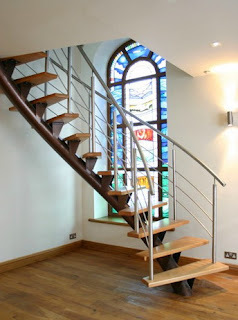 The price of the staircase will most likely depend on the style you choose, however they will range and although they may be slightly more expensive than a manufactured one, they are worth the extra money for the personal aspect they bring to your home. A great feature for the kitchen is a centre island, perfect for providing a place to prepare food and creating extra space. The island is a great way to create a centre piece and adds an air of modernity to the room. The kitchen island is a great characteristic of the kitchen and is perfect for both practical and aesthetic purposes. I like open floor housing! It feels much bigger and airy!